Pristine View, Great Attention to Detail, All the extras. Just read our reviews! Enjoy WEEKLY and DAILY stays in a 4-seasons, private lake home on beautiful Little Round Lake near Hayward, Wisconsin. 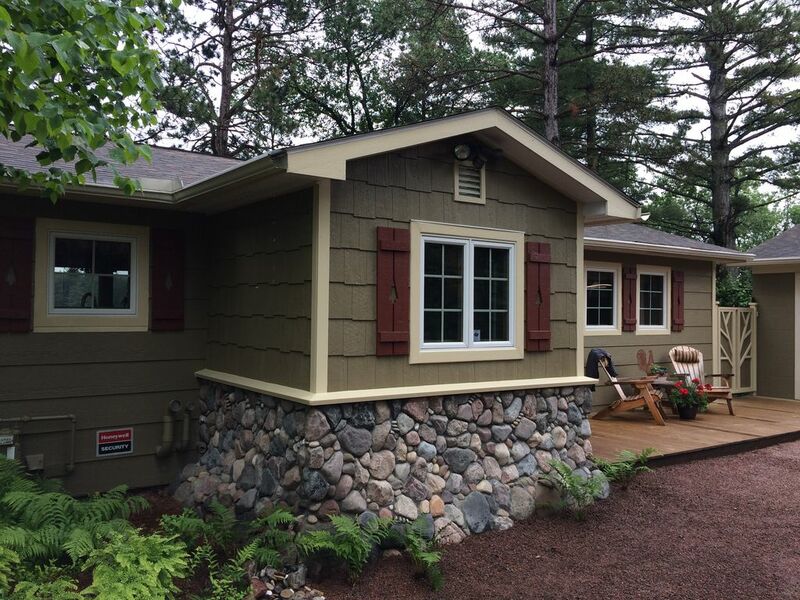 Our cabin is the result of years of heartfelt work to create a warm and comfortable escape in the north woods. The house is surrounded by towering pines and boasts the best view on the lake... although the neighbors claim this as well. We face east and have the joy of breathtaking sunrises year 'round from the living room, dining room, kitchen, lakeside bedrooms and, of course, the deck & screen porch. Step out the front door and Round Lake is at your feet. Pull your boat right up to the front of the house and watch the kids swim while sitting on our large deck. Serve meals under the pines with a lake breeze at your back. Each year we spend a full month at our cabin making sure it's in top-notch condition for our guests... most of which have been with us almost 20 years. Our neighbors are like family and everyone feels at home. I'm a northern Wisconsin native who has never been able to part with my connection to the northwoods... even after 20 years in California. We still spend several months a year at our cabin in Hayward and hope to share the remaining time it's available with folks like ourselves who appreciate the natural beauty of the Hayward area, and a great place to unwind and relax. This is a dual-artist home. Original art fills the house and outdoor surroundings. We also have a chef in the family, so the kitchen lacks nothing. Furnished as a full-time home as it used to be our weekend lake cabin. All dishes are handmade, all art is original. Full walk-out basement with laundry facilities and screen porch for relaxing and dining. Lakeside is a yard with fire pit. My family and I stayed at the Little Round Lake House this summer for the first time and it totally exceeded our expectations. We've been renting vacation homes in the Northwoods for 20+ years and this was by far one of the nicest homes we've stayed at. The house is absolutely lovely with beautiful bathrooms and attention to detail throughout. We never saw a single bug or spider web which is unheard of in the Northwoods! The location is just outside of Hayward which was very convenient. Tim was wonderful to work with. He told us not to bring much because he had everything there and he was right. He called us upon arrival and even prior to the trip to explain things to us about the home which was most appreciated. What was most special to us was how you could walk around this home and see how much Tim has poured his heart and soul into it having grown up in Hayward. For me personally, that was really sweet as I have been going up to the Northwoods my whole life. It was like coming full circle for me. And as my family can attest, they all said, "This was the best vacation ever!" My wife and I enjoyed our stay at this lovely home immensely. The attention to every detail made this a step above other homes we have rented and on par with the finest hotels. The home has a real northwoods rustic authenticity complimented by wonderful art, antiques and whimsy. The home itself is incredibly charming combining the foundations of the past with modern upgrades throughout. The appointments (sheets, dish ware, towels, soaps, kitchen utensils etc) are top notch. The incredible privacy the location affords, the variety of areas to enjoy the lake from, the walking trails/garden/screen gazebo, and the attention to every detail make this a very special vacation home. There are neighbors to be sure. The lake has the happy buzz of summer water sports but only during "decent" hours. Mostly, the call of the resident loons, eagles and geese were the most prevalent sounds. The layout of the property, the use of natural plant barriers to shield the home and dock area, and the wonderful lower level screen porch afford a great deal of privacy while maintaining the incredible views of the lake. The dock was in great shape, with padding and tie offs all in place for the boat owner. The water was beautiful with a sandy bottom and a nice slope to about 6' at the end of the dock. A great place for a refreshing swim! Little Round is not a big lake but it is connected to the large and diverse Round Lake which provides great fishing and boating opportunities. Plus Little Round is only about 10 or 15 minutes from Hayward and about 45 minutes from Cable. This makes a Little Round Lake House the perfect home base for exploring the area and enjoying the quiet that nature has to offer. My family has always had good experiences staying in VRBO properties all over the U.S., but this was certainly one of the best! As others have commented, the accommodations are just about perfect and the view, the lake and the surroundings were just what we were looking for in a relaxing and fun family vacation. Heading down to the dock immediately upon arrival, we were treated to a bald eagle swooping down right in front of us to catch a fish. More eagle sightings and the glorious song of the loons made our stay all the more enjoyable. We enjoyed swimming right from the dock, fishing, playing croquette on the lawn, hiking and biking in the area and a lot of time relaxing on the deck overlooking the lake. Tim could not have been more attentive to ensuring that we had a great time at the cottage - from the day I made the reservation to helping me find a boat rental, checking in during our stay right on through to a post-stay email. The next time we head to the northwoods we will definitely be staying at the Little Round Lake House. This by far is our favorite vacation destination! From the moment you step in the door you feel at home. This home has everything you need to enjoy a peaceful and relaxing vacation. You have the best view on Little Round Lake! Wake up in the morning to beautiful sunrises and birds singing. The kitchen has everything you can imagine, even the dishes were made by hand! Each of the three bedrooms are uniquely decorated and have one of a kind homemade headboards. The "Laundry Lounge" in the lower level (complete with a lava lamp) is a great place to enjoy your favorite tunes with a view of the fire pit on those chilly nights. Our family had enjoyed many fun filled days and nights at this lake home and can't imagine staying anywhere else. Thank you so much for sharing your home with us! Pristine View, Great Attention to Detail, All the extras! I travle globally for work and seldom to run across a place like this! So warm and welcoming, yet unique and memorable. Owners obviously go to great lengths to keep this property in top-notch condition and have created a one-of-a-kind retreat. High quality furnishings, bedding, linens are joined with artistic elements including home made dishes and original artwork everywhere. No framed prints on the walls or cheesy decor here! And the experience leads from the lake shore to private, groomed walking trails and vegetable garden for the guests. Even a private screen house back in the woods comes with the place! Amazing place. Incredible stay. THANK YOU! Our family has stayed at The Little Round Lake House several times and each year that week has become our favorite week of the year. The location is optimal. The home is nestled in on Little Round Lake. It's quieter than a larger lake and during heavy weather you don't experience the heavy chop of a much larger lake. However, if you want to experience the benefits of a larger lake, Little Round is a short boat ride from Round Lake. The lake house is located far enough from the town of Hayward to provide Up North peace and quiet but is close enough to provide all of the advantages of Hayward. Your hosts, Tim and John have thoughtfully appointed this retreat with every comfort you can think of and many creative ones you've not thought of. The facilities, the decorations, the landscaping, the lighting and electronics, and every accommodation, right down to the linens, have been carefully prepared for your comfort, benefit and enjoyment. There are innumerable outdoor activities in the area. Some of the best fishing, snowmobiling, cross country skiing, and ATV trails in northern Wisconsin are literally right outside your door. Get up early. Have coffee on the deck and listen to the loons wake up. Fish and ski the day away. Then, take a nap on the screened porch. Grill up a steak on the BBQ for dinner and then relax by the firepit with 'Smores after the sun sets. Wake up the next day and do it again. You'll be a better version of yourself in no time! Private, groomed walking trails through pine forest leads to organic vegetable & fruit farm.